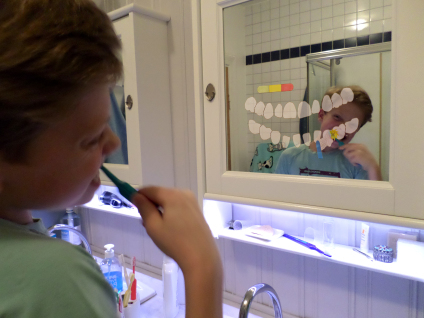 How might I make children create a good habit, by implementing tooth brushing as a fun game? ROLE // First project with concept generated from a single word. Utilised idea-crossing and networking. Streamlined concept via diamond-approach to idea generation and conceptualisation. Conducted market research and created a game, leading to in-depth analysis and the creation of the game. Collaborated on the production of a stop-motion video and created a presentation of ideas. PROJECT OBJECTIVES // Children rarely enjoy brushing their teeth, but it is a habit that is important to implement. CONCEPT // I want to make it fun for children to brush their teeth by making it into a game. Through a sensor in the toothbrush, the bathroom mirror gets activated and a cartoon villain appears on the mirror. The child’s toothbrush also appears, and the child’s mission is now to defeat the villain and clean the mouth.